Group says its new operation will be the "beginning of the end" for Sony. The hacker group "LulzSec" has announced its intention to continue the assault on Sony's online assets started by Anonymous. 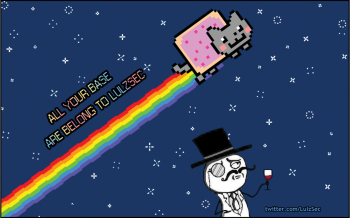 LulzSec has claimed responsibility for the recent successful hack on Sony BMG's Greek website, and the recent attack on the PBS website, which included the defacing of the site, and a phony story about rapper Tupac Shakur being alive and well and living in New Zealand being posted on its front page. The warning for Sony actually came before LulzSec's attack on PBS. Posting on Twitter on May 27th, the group said that it was "the beginning of the end" for Sony. The PBS attack took up most of the group's attention over the next few days, but on May 30th, it said that the operation, which they dubbed "Sownage" would begin on May 31st. Just a few hours ago, a new post on Twitter suggested that not only had the operation already begun, but that it was proving rather successful. LulzSec said that it was "making off with a bunch of [Sony's] internal stuff," but that the company hadn't noticed. As the PBS attack was seemingly prompted by what the group perceived as a smear attempt on WikiLeaks founder Julian Assange on the channel's Frontline program, it seems reasonable to assume that LulzSec's attacks on Sony are motivated by the same pro-free speech/pro-hacker sentiments as Anonymous. The original attacks against Sony were a reaction to the company suing hacker George Hotz and Sony's out of court settlement with Hotz doesn't seem to have let it off the hook.